The company behind the Palm brand revival is out with the news about its new Palm phone device. The new product is basically a "mini phone" backup companion to your standard modern large screen smartphone. The device will debit later in November in the USA exclusively on the Verizon network for around $349 or an extra $25 a month on your phone bill. The device is about the size of a credit card and features a 3.3" 720p display, dual cameras and a 800 mAh battery. It weights a super slim 2.2 ounces and will come in black with titanium or gold metal surrounds. Its running a version of Android 8.1 powered by a Qualcomm Snapdragon 435 with an X9 LTE modem with 3GB of RAM and 32GB of storage. 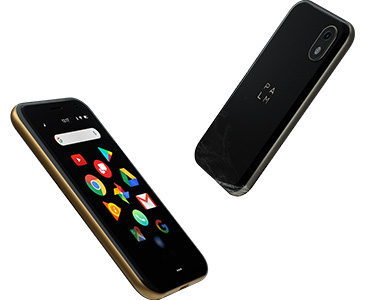 There doesn't seem to be an official name for the device of yet as its simply being referred to as "Palm" in press reviews and on the new Palm.com. The San Francisco based startup company running this latest incarnation of the Palm apparently licensed the Palm brand name from TCL. Other than the brand name, there is very little to no connection to the Palm Inc. that produced PDAs and the Tree smartphones. The rumored Palm smartphone comeback seems to be progressing with a new leak. 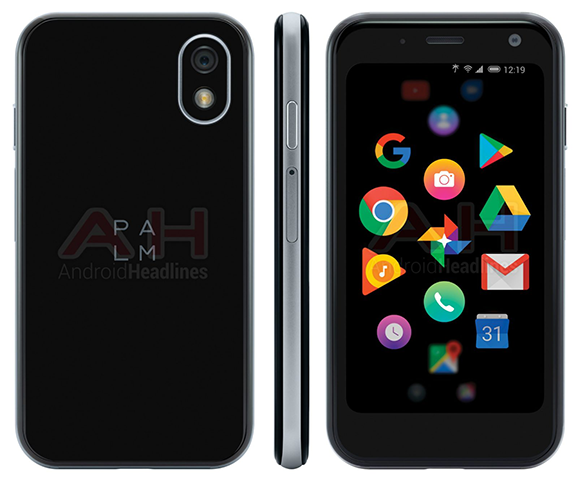 A new photo sourced by AndroidHeadlines shows off a design render of the Palm Pepito aka Palm PVG100. Of note is the small profile and expected 3.3" inch screen that puts this smartphone squarely in the micro size department. The Pepito was last spotted in early August and the latest pic appears to lend credence to some of the earlier rumors with its similarity. The photo also shows some interesting details such as the new Palm logo and a custom Android app launcher. Also of note is a small palm tree icon in the status bar of which its purpose is unclear. 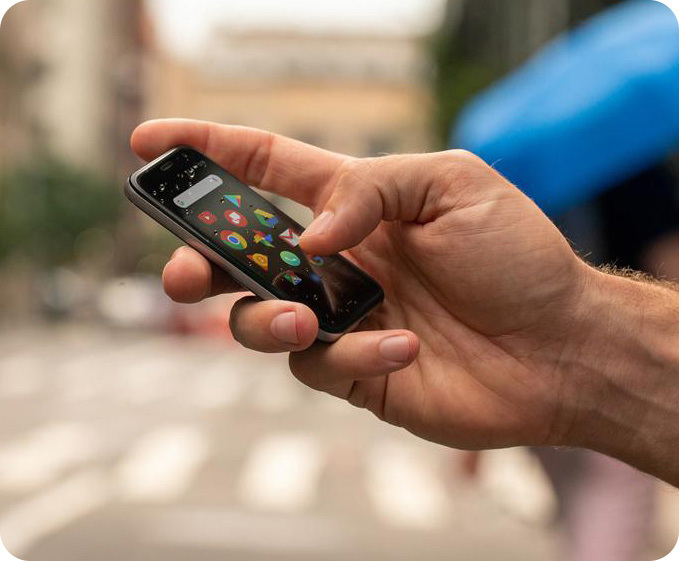 The Palm Pepito device is said to sport a 3.3 inch, 720p resolution screen. Android 8.1 is the expected operating system paired with a Qualcomm Snapdragon 435 processor, 3GB of RAM and 32GB of internal storage. Aside from the new picture no other new details have come to light at this time. Previous sources have claimed that Verizon is anticipated to be the first carrier to offer the device in the United States although an official launch timeframe is still unknown. Android Police once again has additional details on the latest Palm rebrand leaks. This time around the site has published a new set of photos that purport to show the Palm PVG100 phone. Going by the code name Palm Pepito, they also have some new details on the smartphones specs. The pictures show a very small form factor device with a micro display by today's standards. It is said to sport a 3.3 inch, 720p resolution screen. Android 8.1 is the expected operating system and it will be powered by a Qualcomm Snapdragon 435 chip paired with 3GB of RAM and 32GB of internal storage. Newly published FCC documents have revealed a possible new Palm branded device headed our way soon. Our earlier story today showed that new documents reveal that a new Palm PVG100 model has been submitted for testing to the FCC. While the actual device photos are still under wraps, one potential piece of the final product has been included in the release. The documents show a proposed label for the device which lists the usual FCC ID, Serial and IMEI numbers and barcodes. The label also includes what may be the first hint at what the new logo that could be used for the Palm brand relaunch. The full image suggests the logo may be placed on the back of the device or possibly within a battery compartment. Update: New leaks appear to confirm this is indeed the new logo for the Palm brand relaunch. The Palm brand is set for a comeback in 2018 according to a new report. Palm smartphones and potentially other devices are expected to debut next year from China based multinational electronics firm TCL. The news comes from an interview with a TCL marketing manager with the Dutch site Android Planet. The TCL rep did not get into specifics but is quoted as stating that Palm products would be announced in early 2018 and hinted that it would include smartphones. CRN has posted excerpts of a new interview with HP CEO Meg Whitman in which she reveals some insight regarding her stance on the future of WebOS. 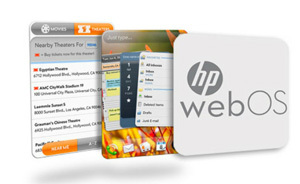 On slide # 10 of the multi-page spread, Whitman firmly states that HP "(has) to have a tablet offering. We will be back in that business. We're coming back into the market with a Windows 8 tablet, first on an x86 chip and then maybe on an ARM chip. We'll see." Slide #13 and #14 discuss HP's message to the remaining people on the WebOS team and the rest of high-profile departures, some of which we have recently covered. Whitman says that "This has been a very rocky period for the former Palm team/WebOS team that we built. And this was not a happy set of occurrences over the last six to eight months. So we have lost some people." She surprisingly even states that "Between August and November, there was no plan." The Premiere Palm Software,	News & Review website. GlassWave (formerly MobileInfocenter) also makes apps for iOS.